This report was published by the Defence Academy of the UK in 2013. It offers a systematic way of thinking about cyberpower and its use by a range of global players. It emphasizes the value of the civilian Internet, and its critical contribution to economic growth and social development, as key things that Internet militarization should aim to protect. The report is also available for download from the UK Defence Academy website. This speculative article for in-house architecture magazine D&A issue 17 in 2012 looks at the future adaptation and evolution of the city towards sustainability as a function of global cultural change. Two waves of change based on shifting values could shape architecture and urban design far into the future. Modernity is in decline, and is being eclipsed by the new values of transmodernity. This paper, which forecasts an imminent tipping point in cultural values, was published in the March 2011 edition of the Journal of Futures Studies (Vol 15, No 3). What Kind of Crisis is it? A paper co-authored with Andrew Curry of The Futures Company, exploring the global financial crisis as a ‘crisis of crises’, published in the March 2010 edition of the Journal of Futures Studies (Vol 14, No 3). A set of scenarios developed for the Chatham House Food Supply Project in 2008 that helped to reframe government and industry thinking about the future UK food supply during the 2008 reversal of a 30-year downtrend in food prices. Food Futures – Rethinking UK Strategy, the full report, January 2009. 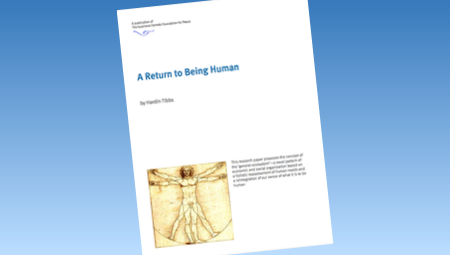 A 2009 white paper that explores a shift of perspective on what it means to be human. This paper also appeared as an article in the online publication Reality Sandwich. The Value Loop is a proposed ecologically-inspired concept for business value-creation. This appeared as a chapter contributed to The International Handbook on Environmental Technology Management (Edward Elgar 2006), edited by Dora Marinova, Head of the Institute for Sustainability and Technology Policy at Murdoch University in Australia. The value loop idea also appeared in simplified form in a piece published by Strategy+Business in 2007. This is an enthusiastic review of a presentation on global prospects given by Hardin Tibbs in Johannesburg in 2007. The reviewer, a magazine columnist, compares Hardin not only to Moses but even Al Gore. It appeared in the July 2007 edition of AutoInsight magazine. This 2003 paper exploring the need for persistent digital identity, to build trust into the next generation internet, is the result of a two-year process involving an interdisciplinary group of 25 professionals, the Link Tank, who met in California between 2000 and 2002 (see page 75 of the report for the list of participants). A first-hand impression of the United Nations World Summit on Sustainable Development (WSSD) that took place in Johannesburg, South Africa, from August 26 to September 4, 2002. Transcript of a presentation delivered in Auckland to the New Zealand Public Service Senior Management Conference in October 2001, one month after 9/11. This was one of a number of similar presentations I made internationally in the years just before and after 2000 on the theme of a coming global crisis and where it could lead. A 2002 article in the online publication PlaNetwork Journal that explores the importance of interactivity as a principle of online participation. It includes a set of scenarios for the future of the digital commons. A chapter contributed to Sustainability, The Corporate Challenge of the 21st Century (Allen & Unwin Australia, 2000), edited by Dexter Dunphy, Director of the AGSM Centre for Corporate Change at the University of New South Wales. An exploratory piece written in 2000 and posted online by The Arlington Institute, that explores the idea of a normative global objective and strategy. This definition of an optimistic outcome for the world future was tested with a number of audiences worldwide and appears to have international appeal. An article originally published in Yes! Magazine in the spring of 1998, in anticipation of the year 2000. The online version lacks the figures that appear in the original printed edition, and in the PDF that can be downloaded here. A paper presented in September 1999 to the Australian Public Service Futures Group in Canberra, exploring the idea that when we think about the future we are essentially dealing with a psychological space. A future-oriented survey of the concept of sustainability. It is based on the report of a study commissioned by the Electric Power Research Institute (EPRI) in Palo Alto, California in the mid-1990s and released in this public version by Global Business Network in January 1999 as one of their Deeper News publications. This thought-leadership piece was commissioned from GBN by Japanese advertising company Dentsu. It was published in Japanese translation in their in-house journal in 1992. How Many 'Amorys' Does it Take to Save the World? A report about a March 1992 GBN Worldview meeting in Aspen, Colorado to discuss sustainability. In attendance were Amory and Hunter Lovins, Donella Meadows, Anders Wijkman, Joel Garreau, Danny Hillis, William Joy, Kevin Kelly, Art Kleiner, and Joseph Romm among others, plus GBN’s founders and a cross-section of its corporate members. A seminal white paper on industrial ecology originally published by Arthur D. Little Inc. (ADL) based on work in the late 1980s, and republished by Global Business Network (GBN) in 1993. A 1992 paper introducing the concept of industrial ecology, which involves the redesign of industrial infrastructure to make it compatible with natural ecological functioning. This paper was based on a 1991 Arthur D. Little white paper on industrial ecology.